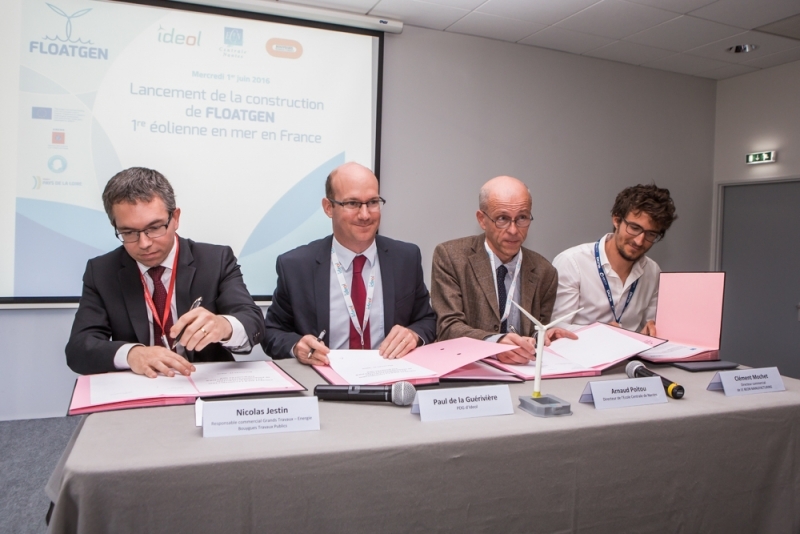 Equipped with a floating foundation designed by the French expert, Ideol, and built by Bouygues Travaux Publics in Saint-Nazaire Port, it will be installed on the Centrale Nantes offshore test site, SEM-REV, off the coast from Le Croisic. There are over 3000 offshore wind turbines around the world – the overwhelming majority of which are “fixed” i.e. attached to the seabed, but none as yet in France. Backed by a European consortium of seven companies and research bodies, Floatgen is leading the way with several firsts. The first offshore wind turbine in France – the blades of this 2MW turbine are set to rotate for the first time in 2017, much earlier than for a fixed turbine – but, also the first full-scale demonstrator of the ring-shaped floating foundation developed and patented by Ideol. The aim of this project is show the tremendous commercial potential of offshore floating wind turbines. They will produce electricity from a renewable source at a significant distance from the coast, thus preserving the visual integrity of the coastline, at a reduced cost thanks to the stronger winds further offshore. It will also underscore the industrial potential of this new sector which will lead to job creation on both a local level near the installation sites, where concrete is the main foundation construction material, as well as with the main suppliers, as illustrated by the contract signed with Le Béon for the supply of the anchoring system. Construction will get off the ground in September in Saint-Nazaire Port, where Bouygues Travaux Publics will build the floating foundation, mobilising 80 workers on site. At the conclusion of the six-month construction phase, the wind turbine will be fixed into position, quayside, on its foundation. The whole assembly will be subsequently towed out from the Le Croisic coast to the installation site, SEM-REV, the world’s first multi-technology offshore test site connected to the grid, owned by Centrale Nantes and run jointly with the National Center for Scientific Research. Once on site, the wind turbine will be connected to the anchoring system and the electricity export cable.